Though we have never met, I feel like I have known you forever, so I’m going to dispense with the pleasantries and just call you Jeff, if I may. Well, Jeff, I know your birthday is fast approaching (no, I am not being creepy stalkerish, it’s public information for those who already have one finger on the phone to the police), and unfortunately I am not able to give you a present as awesome as the “FBI Profile” file that a group of us gave you last year. So I hope this open letter will suffice. Now, as you know, I am a big fan of yours. There may be a small dissident group who think genuine fans are sycophants and like to diss other fans for their support – but thankfully that is just a minority. Your show, WHITE COLLAR has got me addicted to the point of unparalleled obsession. I have lost sleep because of you and your crazy cliffhangers. Because of you, I discovered the world of fan-fiction and it re-ignited a passion for writing that I had not experienced since high school. Because of you, I have also discovered the world of slash-fiction…let’s not go there…I can’t write it but, boy, do I admire the talented people who do! So now let’s move on to the season 3 finale, “Judgement Day”. Let’s start with the spelling. We here in the commonwealth spell it with an “e” in the middle but what’s a letter here and there between friends, right? I know you love leaving clues and hints for fans to find, so let’s take a look at the bread crumb trail you left for us that led to where we are now. There’s the U-boat treasure: there was a LOT of it when Mozzie took it from Vincent Adler, and whilst there was a lot of it that was “returned” by Keller, we should have known there would be more hidden somewhere else. After all, the man who believes a safe word that is two words long did tell Peter and Neal that he had hidden it in a few places when he handed it over to save Elizabeth in “Checkmate”. So why should we be surprised that he had stashed some of it for backup? Raphael’s St George and the Dragon has been a topic of conversation since Sara Ellis was introduced in Season 2 and although Neal never admitted to having stolen it, we always knew he must have it. The I-never-said-I-had-the-music-box-but-I-just-let- everyone-believe-I-did trick can only work when it’s not over-used, so, well-played in finally giving us closure on the whereabouts of the painting. I know you are enjoying looking at it hanging in your house now. Agent Kramer (to be honest, I was really hoping his first name would be Cosmo, like in Seinfeld, as an homage to Tim DeKay’s excellent turn as Bizarro Jerry on that show) saying to Neal “I’d say this moment was inevitable” at their first meeting should have given us an idea that he was determined to catch Neal, but who knew he would be this vengeful and that those words would be repeated as Neal is caught red-handed with the painting in his hand? I am very glad you didn’t go with “Commuted” as the title of this show because having read some TV reviewers try to spell this, I would expect the show might not have lasted more than one episode (computed, communicated, commuter? Arrrggghhh!). A few of our oft-asked questions were answered during the hearing: Neal’s middle name is George – a name he has used in his many aliases in the past (named after your beloved pooch); June’s last name is Ellington (we know you like jazz…hello Satchmo! ); and Peter’s recommendation would have the most impact on the final decision. How did the FBI get their hands on private letters Neal wrote to Kate when he was still in prison? Is it the norm to intercept and copy them before being sent out? Why was Peter’s team never able to crack the code before? I would never want to assume incompetence, so I will just assume Neal’s code was just that good. We all remember the long night of drinking and confessing between Neal and Peter in “Forging Bonds” when they were chasing Adler. When Peter gave Neal immunity, I always wondered what other notable crimes he had committed. I’m sure there is a very long list and I hope we will find out more about them in the years to come. Being haunted by his past is what Neal has been forced to come face-to-face with. Peter once said to Elizabeth that Neal never faces the consequences of his actions. But now he does – sort of. A crime he committed seven years ago is threatening to bring him down. But as always, he is saved from the consequences, thanks to Peter’s quick-thinking and a bit of plotting with Sara, and what a wonderful turn from Sara’s boss, Winston Bosch, who looked peachy keen that not only has he recovered a $15 million painting but also saved money on having an expert authenticator. Your friend, Matt Nix, once dared suggest that WHITE COLLAR is a show about two good-looking, well-dressed guys walking and talking and solving crimes with their witty banter. Well, you sure showed him! This season alone has seen Neal BASE-jump off the 43rd floor of a high-rise on to Wall Street with a perfect landing and not a hair out of place. It was a feat seemingly so ridiculous that even Peter didn’t believe it could have been done when Neal confessed to how he got away with Degas’ Entrance of the Masked Dancers. As if that wasn’t enough, Neal climbing to the top of a moving cable car in mid-air, then flying through the air to reach the top of the approaching one in the opposite direction, and grabbing the painting tube he nearly dropped into the river during the jump – wow, my fingers are exhausted just from typing that. And speaking of that action-packed sequence, what’s with the Roosevelt Tram being called a tram and not a cable car? Don’t trams normally run along the ground? But I digress…the most significant moment in that scene, in my opinion, is not the jump but what happened afterwards – Peter flat-out lied to his former mentor about whether Neal had the painting on him. Maybe Peter could count that as a technicality because Peter didn’t know for a fact what was inside the tube Neal was carrying. I am grateful to you for this action sequence and for not letting Matt Bomer’s character die, because, as you know, fans like me have endured way too many “Boments” when we have watched him die some not-so-pretty deaths in some of his roles. We all wanted to know more about Neal’s family. Throughout the series we have seen how Neal has bonded with those around him. They consider him as more than a friend or colleague – they consider him family. It’s not just because he is charming and good-looking, although of course that helps. But deep down, Neal Caffrey has a good heart. It’s just that, well, if Lady Gaga is right and we’re born this way, then Neal believes he was born bad. We got a hint of Neal’s biological family in season 2 when he mentioned his father was a dirty cop and that he was dead. Now we know he wasn’t always dirty and he isn’t dead. But if Caffrey Snr wasn’t always evil, as revealed by the mysterious US Marshal-protected Ellen Parker (who was his partner), then shouldn’t this give Neal cause to reassess his belief that he was born bad and that he doesn’t deserve the white picket fence existence he so craves? I have to admit I did a little happy dance in front of my TV when the tidbit about Neal’s parents was revealed because it was what I had postulated in my fan-fiction. I had him alive and well, in witness protection, but Neal didn’t know it until after he was handed the U-boat treasure (in my version of events, it was Caffrey Snr who was responsible for switching the art from under Adler’s nose). For all we know, he could be in WitSec. After all, Ellen is, and we don’t know why…yet (hint: I hope we will find this out in season 4). Neal George Caffrey. There have been far too many teases about this possibly being an alias. I, and many others like me, don’t want to consider this at all. We have all grown to love this name, even if some people can’t spell it right (my favourite version to date is Neil Cafferty, though I have seen worse but it was such sacrilege that I promptly erased that from the limited space that is in my brain). I know you have also said that Neal didn’t say that Neal wasn’t his real name, so I take small comfort in that, and I want to hear that long story he avoided telling Sara in “Stealing Home”. I am sure this will make for a great story in season 4. I’m not just talking about the myriad of expressions on Neal’s face when he boarded the plane in the final minute or so of the episode. A while ago, in another impromptu Q&A session, you mentioned that you wanted season 4 to open outside the US. Not just outside New York City, but in a totally different country. When I read that, I was aghast! Considering the FBI doesn’t have jurisdiction internationally, the only reason the show could take place outside NYC is if Neal is on the run. I got angry – at you for even suggesting that as a possibility, and at Neal for thinking that Peter would not support him at his hearing. It made me unfollow you on Twitter – yes, I was that angry (but I over-react so it’s ok. I will send you the therapist bills later)! But then I calmed down. You would never break up my favourite bromance! Inconceivable! And sure enough, when Kramer reappears, it all became clear – Neal would never run from Peter. He is running from Kramer. So how about Peter’s subtle shake of his head when Kramer confronted him at the steps of the Federal building as he was about to make his recommendation to the commutation hearing committee. My first instinct when I watched that scene and Peter’s expression (oh Tim – that face!) was “OMG NEAL! Peter is telling you to run!” and I was relieved. Yes, I was right – Neal would never run from Peter and Peter is putting his career, and possibly his life, on the line by giving his friend his blessing to run. After multiple viewings of that scene though, you had me doubt myself for a moment – what if Peter, the ever judicious and righteous, law-abiding man, was actually telling Neal not to do anything stupid like running? After all, Peter tells him that all the time, right? But then, when I saw a tiniest hint of a smile on Peter’s face when Diana interrupts his statement at the hearing with the news that Neal had disappeared, I was happy again. Ah, Jeff, you nearly tricked me there! So now, then, what about Neal’s face? As he sat down in his seat, he looked out the window, contemplative. Was there a hint of regret – at having to run and give up the life he had worked so hard for; the family he has left behind? Was he scared – for what will happen to Peter with him gone, because we all know Peter is going to be in deep trouble now? Was he sad – after having made the choice to stay, he was forced to leave? Was he angry – at Kramer for all that has happened; or even at himself for letting it happen? And then in that final moment, was there a slight smile on Neal’s face as he contemplates a life of freedom without an anklet? Is he going to live the dream life that Jones says he has, only now without being tethered to an anklet and with a mother-load of treasure to be shared with his pal, Mozzie? Where to from here sir? Lolanna has become a symbol of Neal’s freedom. She is from a non-specific island. I would like to think that Neal and Mozzie have run away to the biggest island of all – Australia. Let’s face it, if they came here, they could blend in, enjoy the sunshine and we have wine. Plenty of wine. And good stuff, too! And great art! I’m not suggesting they steal it, of course. So how about it, Jeff? That’s all I have for now. I have lost a lot of sleep since I discovered your show nearly three years ago. It has been a long journey and one that I hope will keep on going for a long time to come. Now I shall leave your merry band of worker bees to go back to work on what I am sure will be an amazing season 4. Thanks Mark, Jim, Joe, Alex, Channing, Matt and Dan. This entry was posted in Film & Television, TV Reviews and tagged burn notice, fan mail, fanfiction, finale, In Plain Sight, Jeff Eastin, Judgment Day, Matt Bomer, Matt Nix, Tim DeKay, USA Network, White Collar on March 1, 2012 by Valerie Leung. Yea. Such a great recap and kudos to the writing team. Insteading of dreading how they were going to put the pieces together like at the end of S2, this cliff hanger holds so much excitement! Finding out more about Neal; his family; his life; where do Moz and Neal go; how long before Peter finds them (and Sara tells about the passport); how does Peter maneuver around Phil Kramer (Phil? seriously?). Yeah, bring it on. For most of S3 there were a lot of people upset with Peter for accusing Neal of stealing the treasure. I blamed Mozzie. I blamed him for a LOT of things. Lol. Now he’s given Neal an escape plan. It is exciting and nerve-wracking and I will continue to lose sleep over this! 🙂 I am trusting that Jeff will not keep Neal and Peter apart for too long in S4 though! It’s nice, when you trust a writing team so much that you don’t have to actually fret over what will come next. I’ve watched other shows where the resumption of the series almost seemed like a non-sequitur when watched in the context of the prior season-finale. Not so with this group. Not only do they like to tie up their loose ends carefully, but they also do it rapidly, not letting immediately presented questions drag on and on, unless they are central to the series or season arc. Looking forward to S4 and thinking that, if we love filming in NYC – one of the great cities of the world – then opening in another great city (Paris, perhaps?) would be a good fit for the talents of all parties involved. Including the fans! And also another great city (so I’ve heard)! But if I were a betting person…my bet’s on Paris. Val, you’ve outdone yourself. This is a fantastic post. I love your witness protection idea. But that would mean his dad really isn’t a dirty cop. And an IPS cross idea is growing on me more and more. The scene with Sterling Bosch was the best. 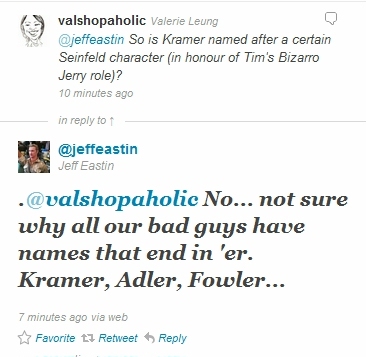 I think you are right that it is Peter who has changed, not Kramer. Also, I don’t think it’s “norm” for the FBI to copy inmate letters, but Peter had said that they suspected Neal was sending Kate coded messages, so I think they were just keeping copies of his letters. Just briefly on the ending… At first, I thought it would be out of character for Peter to tell Neal to run. I thought maybe the head shake was just telling him not to come back at 5pm, that way the board would deny Neal and he would stay with Peter. But, that doesn’t make sense because Kramer would still come after him. The last shot was initially sad, and then very hopefully. I actually think a good movie could have ended here- with all the possibilities left open. If you’ve watched In Plain Sight you’ll know there are plenty of crooks in witness protection! They turn on those crooks worse than them, then have to go into hiding (yes, I watch too much tv). Can’t wait to see all the theories coming up in the next few months till s4! I am in awe of your amazing writing skills! Another beautiful post! I feel your open letter to Jeff is in some ways a letter from all the White Collar fans, including myself. I feel so much as you do about this show we have become so obsessed with! You put words to paper in a way that I never could, and I thank you for being the talented writer that you are! Cheers to you! Cheers to Jeff and his talented team! Cheers to an amazing season 4 of White Collar! As usual it’s been a pleasure reading your work. Wouldn’t be fantastic if Neal and Moz are in Australia! Season 3 has been amazing. Can’t wait for the next one. beautifully thought out and written. eastin should include you in the writer’s cabal. keep going val! I´m a huge fan of your writing! I´m from Mexico! You don´t know me and we have never talked, but I like your blog a lot! This letter is amazing! I must say…this letter speaks for myself too! love it! I love White Collar and all the cast…I hope to meet them someday! Just loved this letter! it´s so unique and it does speak for every White Collar fan! Bravo, girl! You´re a great writer! Looking forward to the next post…much love from Lisbon!